The last Sunday in September found my old school friend Eddie and I hanging out in a car park just down the street from Dalston Junction. 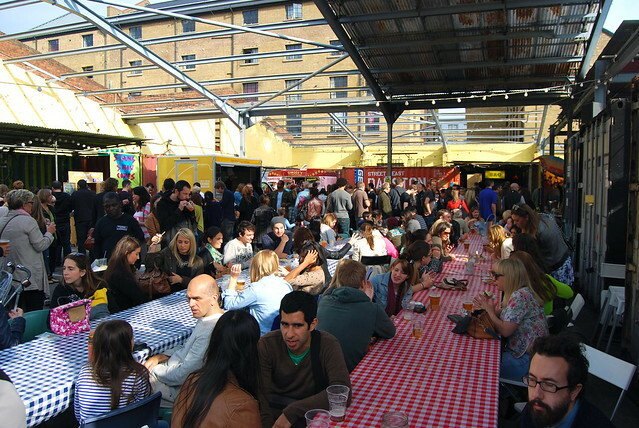 All through the latter part of the year I spent in Los Angeles, and over the Summer while I was in the countryside without a base in London I lamented my missing out on Street Feast London and associated street food events where all the cities best vendors gathered at the temporary spot that had been christened Dalston Yard. It seems the moment I got my keys for my new flat in the city the event was over until they found a new venue (still a work in progress). 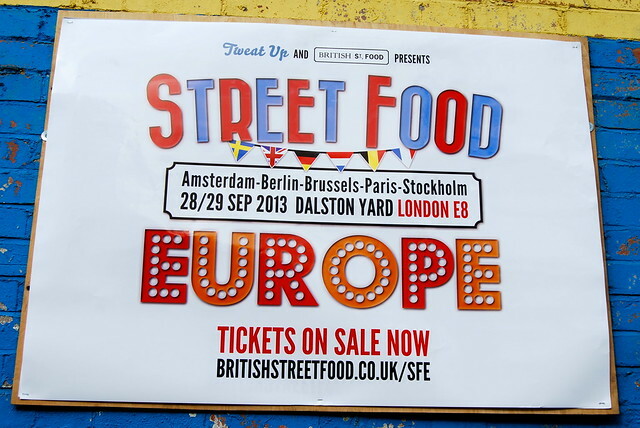 So, when I heard about Street Food Europe, where not only were some of the best British street food vendors going to be gathering, but some from around Europe too I knew I just had to get tickets for my first London street food pop up experience. 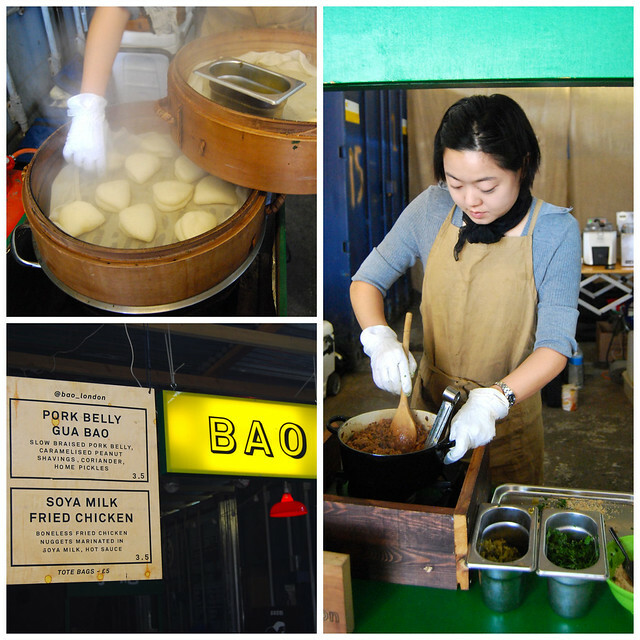 After wondering around and surveying all the options we decided to kick off proceedings at Bao London, which is a wandering market stall serving up Taiwanese cuisine, including Gua Bao, the traditional pork filled milk bun. This should be familiar to anyone who has read a review of Flesh & Buns by now. It was filled with pork belly, coriander, asian pickle and peanut powder, and (though I did not have the peanut on mine, can’t stand the things) it was divine. Such a satisfying couple of mouthfuls to start the day off. After digging headfirst into the pork buns, we felt like we needed a palette cleanser before moving onto something a bit more substantial. 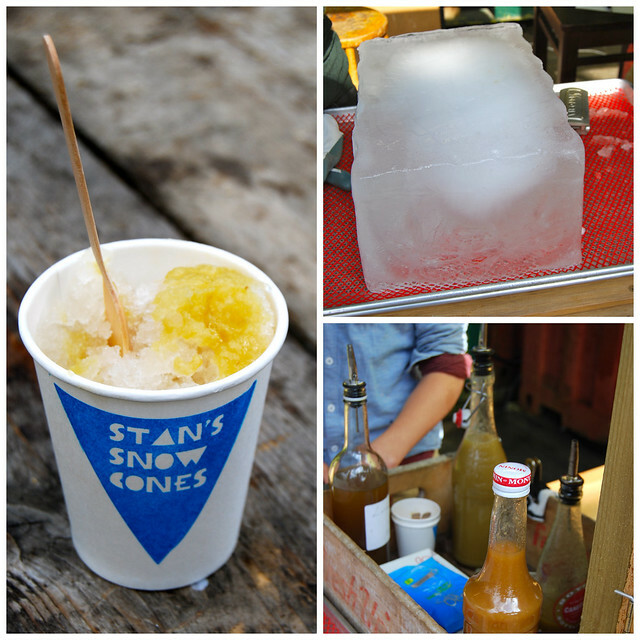 This came in the form of Stan’s Snow Cones. Essentially, ice shards are shaved off of a massive block of ice and topped up with fruit syrup. I had Rhubarb and Jasmine, which was lovely and refreshing, but I felt like I have made a tactical error not ordering Eddie’s selection of Plum and Almond that was so packed full of flavour. Oh, there is something I forgot to mention about Stan. He is just a 13 year old kid from Lewes who saw snow cones being made on the streets of New York, asked the vendors where they got their kit, and lugged it back to England with him. I wish I was that enterprising at his age. 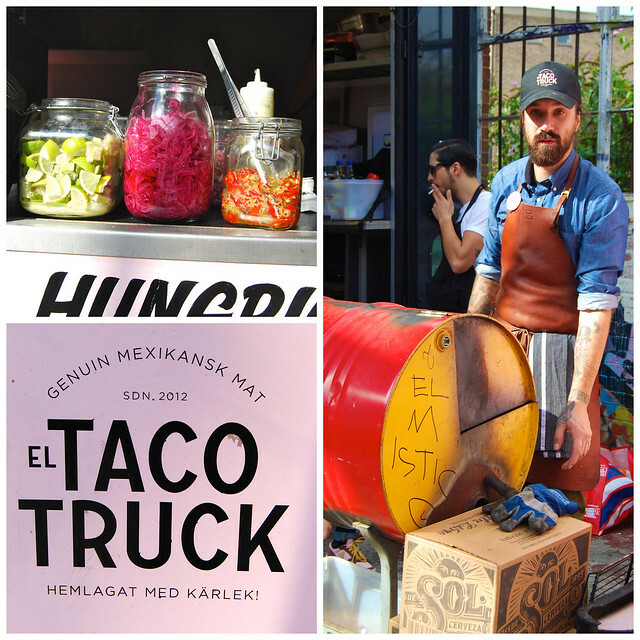 Next up was the big pink El Taco Truck all the way from Stockholm. You locals, this is a truck you need to catch up with. 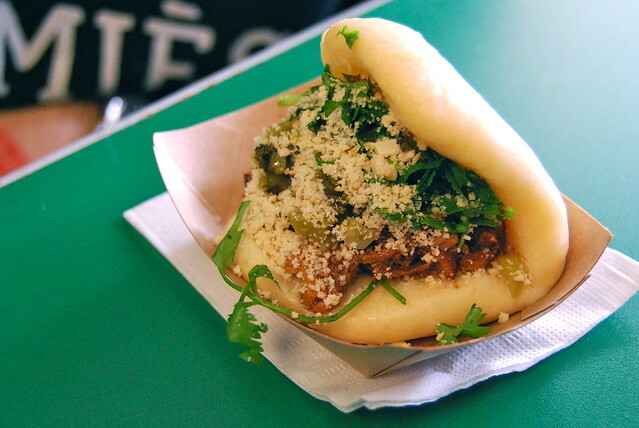 Pretty basic, they had on sale at Street Feast three tacos: Smoked Port Chuleta, Refried Beans and Soft Shell Crab. For me and my memories of California, the only taco in my book is stuffed with fresh seafood. 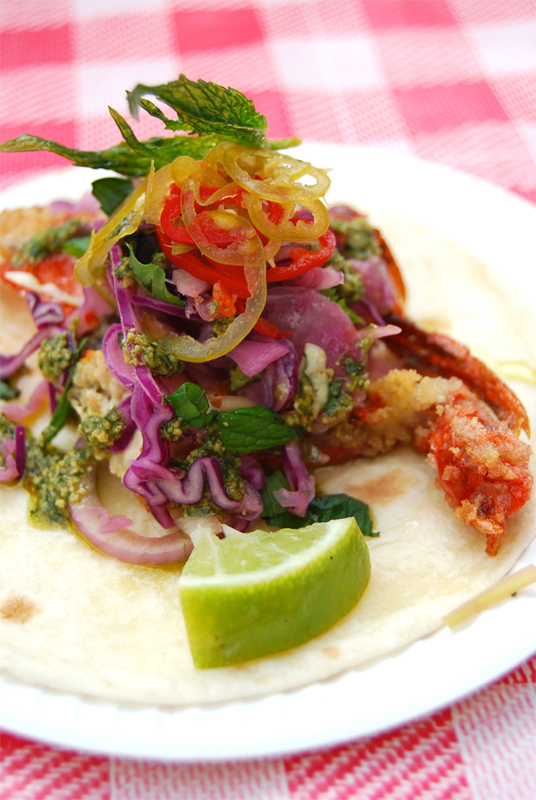 Say hello to my Soft Shell Crab Taco, which up until my dessert (more on that in a bit) was the best thing I ate at Street Feast. Now, being an honorary and former Angeleno, I have in my mind have the bar for a good seafood taco set pretty high. 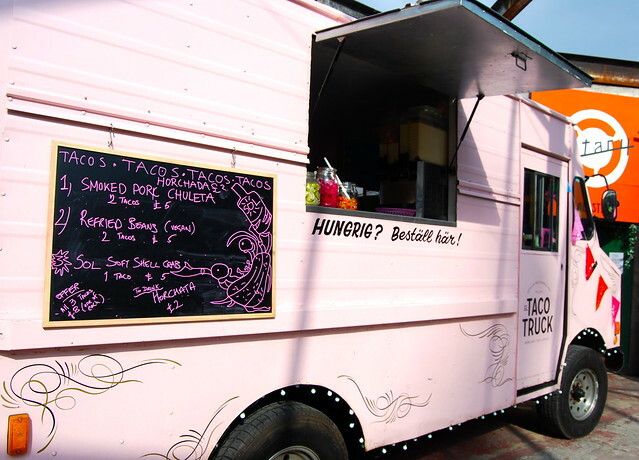 So much so that I initially thought I did not like this taco, because it was not up to the scratch of what I thought a taco should taste like. The shell was not right, and the pickle was a bit too European, rather than Mexican in flavour. But then I bit into the lightly tempura soft shell crab. I got such a divine and fishy seafood bite I was suddenly transported back onto the Santa Monica waterfront. It was a bloody good taco, and as I said, one of my favourite things that I ate that afternoon once I got over my initial mind set of what a good, Mexican seafood taco should taste like. Let’s spend a moment to talk about something that had been recommend to me, but Eddie had to sample instead on account of the masses of cheese I could not eat. 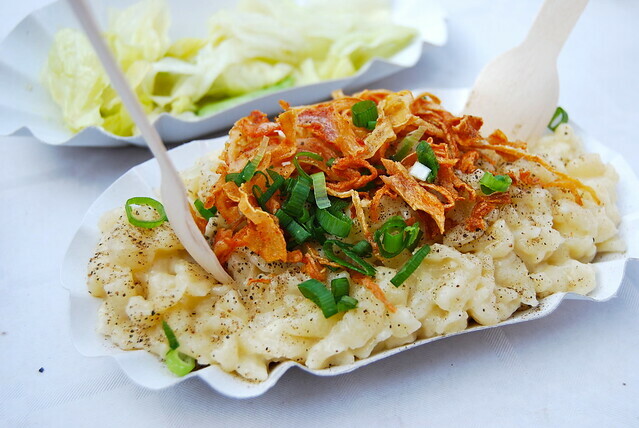 From a German food truck came this regional speciality of Kaesespaetzle noodle casserole. Essentially homemade pasta with homemade cheese (three types) to make a rich and creamy mac and cheese. 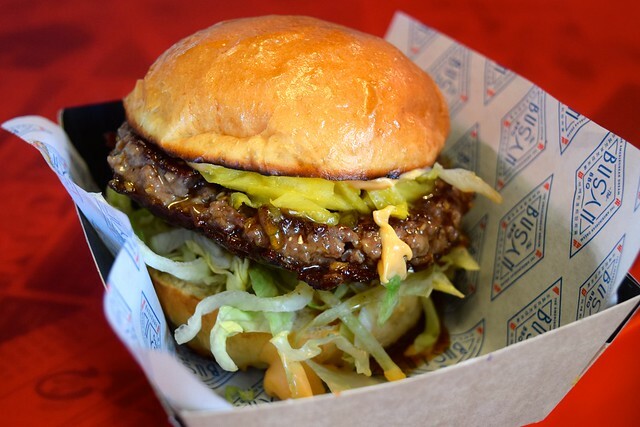 It was topped with spring onions and crispy fried onion pieces, and I can tell from his face and how fast it disappeared, that it was fantastic. 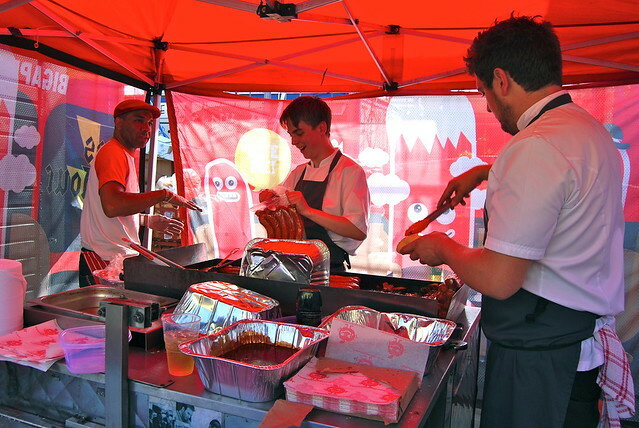 No London street food fest would be complete without Big Apple Hot Dogs which has been on my radar and a favourite of mine since Rose profiled their original pitch by Old Street Station back in 2011 and I had one for dinner after an interview for a freelancing gig around the corner. 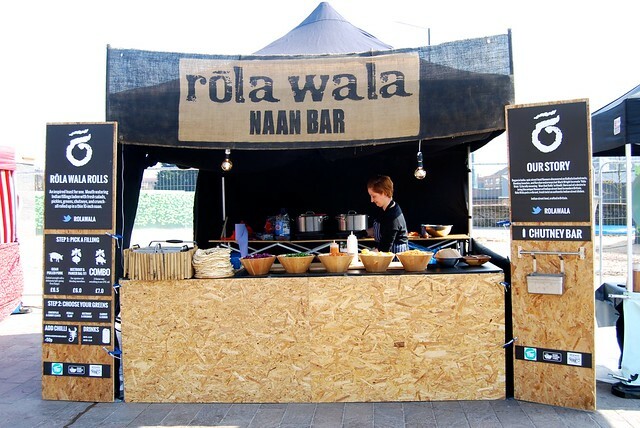 Well, they’ve come a long way since that small stall and they can be found on quite a few menus throughout London. As we were getting pretty full at this point we opted to split one of their straight pork hot dogs before adding our own choice of toppings. 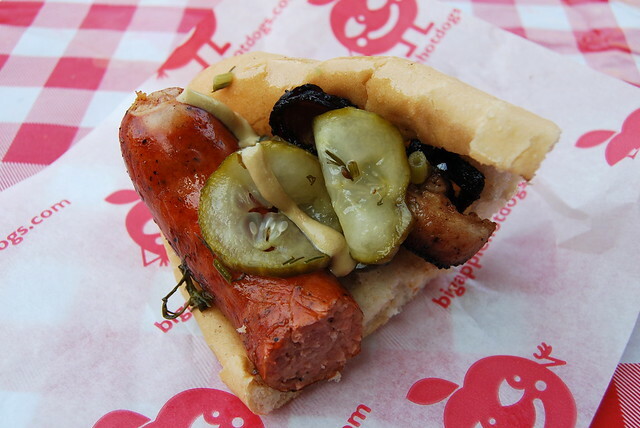 My half of the thick, juicy, meaty and luscious dog was finished off with German mustard and perfectly picked cucumbers, a favourite condiment of mine since I pickled my own this Summer for the first time. After a beer break, dessert was calling. As you can tell from the above photo I stole from Eddie’s Instagram, when I know there is going to be ice cream involved I’m a woman on a mission. 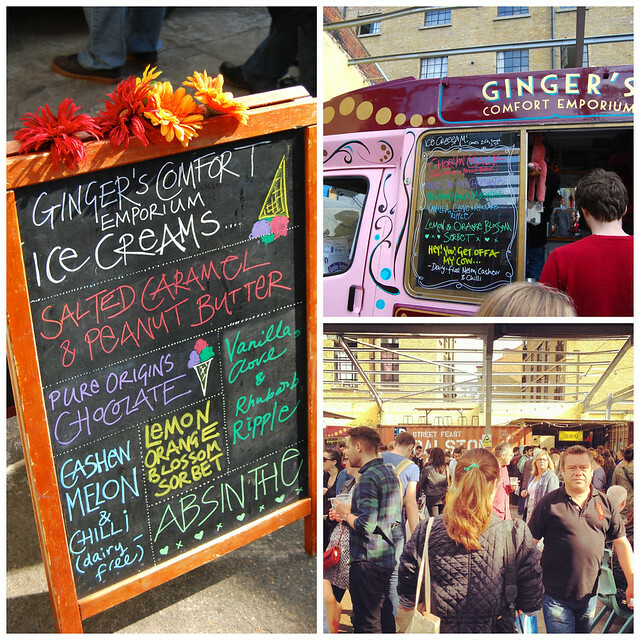 Let me introduce you to what I thought was the very best street vendor that day, Ginger’s Comfort Emporium Ice Cream Truck. Now, she’s Manchester based, so I’m absolutely begging all of my readers based up there to hunt her truck down, because I promise you that she will serve you up some of the best ice cream you’ve ever tasted. For the rest of us, she has a recipe book out called Melt that is already on my Amazon Wish List. This is my masterpiece that I was served up, which incidentally has become the most popular picture on my Instagram feed, ever. 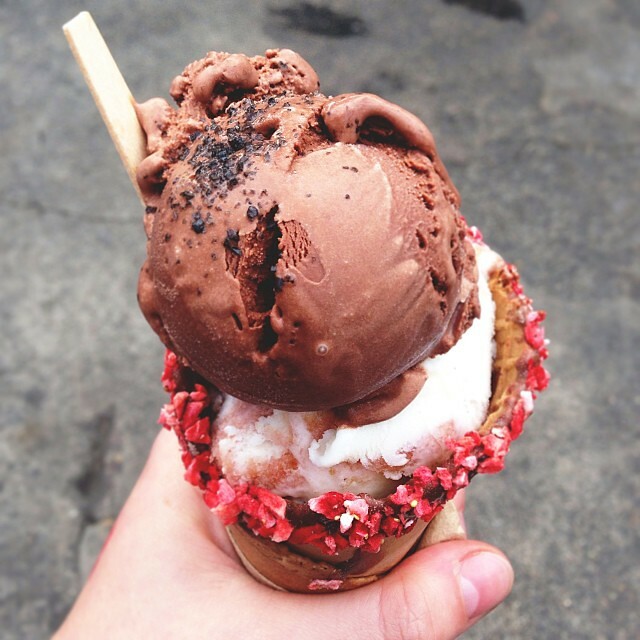 So, starting from the bottom we have a chocolate and freeze dried strawberry dipped waffle cone. Then, a generous scoop of Vanilla, Clove and Rhubarb ripple. Then, another massive scoop of Pure Origins Chocolate, topped off with a little sprinkling of simply delicious and flavour enhancing black salt from a little jar that was perched on the counter. And it only cost me £3.50. The moment I got home I started plotting how to reproduce this perfectly balanced, sweet, tart and delicious ice cream base. As for the top chocolate scoop, I promise you it will be one of the best chocolate scoops you’ll ever taste. Manchester? Do me a favour and go find that damn truck. 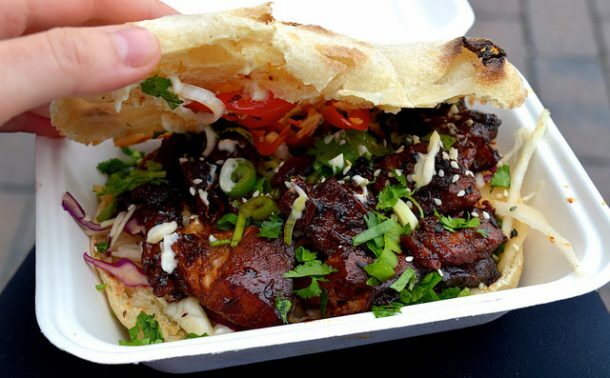 So, obviously Street Feast Europe was a one off event, and while if you are local to them I urge you to go around and find all of the trucks I’ve mentioned, you’re wanting to know how you can find out about other events like this in the future, right? 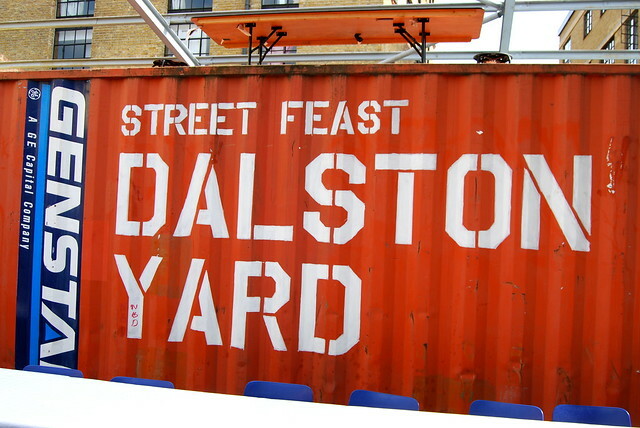 Street Feast Europe was a collaboration between Street Feast and Tweat Up, so you can pop over to their sites and sign up to their newsletters to find out when their next London street food events are going to be, and you can also follow Street Feast and Tweat Up on Twitter. I will be seeing you at an event in future!